2.1. For the entities following April-March as their financial year, the framework shall come into effect from April 01, 2019 and for the entities which follow calendar year as their financial year, the framework shall become applicable from January 01, 2020. Explanation: The term ‘Financial Year' (FY) here would imply April- March or January-December, as may be followed by an entity. Thus, FY 2020 shall mean April 01, 2019 - March 31, 2020 or January 01, 2020 - December 31, 2020, as the case may be. iii. have a credit rating of "AA and above", where credit rating shall be of the unsupported bank borrowing or plain vanilla bonds of an entity, which have no structuring/ support built in; and in case, where an issuer has multiple ratings from multiple rating agencies, highest of such rating shall be considered for the purpose of applicability of this framework. 3.1. A listed entity, fulfilling the criteria as specified at para 2.2 above, shall be considered as a “Large Corporate” (LC) and such a LC shall raise not less than 25% of its incremental borrowings, during the financial year subsequent to the financial year in which it is identified as a LC, by way of issuance of debt securities, as defined under SEBI (Issue and Listing of Debt Securities) Regulations, 2008 (hereinafter "ILDS Regulations"). Explanation: For the purposes of this circular, the expression "incremental borrowings" shall mean any borrowing done during a particular financial year, of original maturity of more than 1 year, irrespective of whether such borrowing is for refinancing/repayment of existing debt or otherwise and shall exclude external commercial borrowings and inter-corporate borrowings between a parent and subsidiary(ies). ii. From FY 2022, the requirement of mandatory incremental borrowing by a LC in a FY will need to be met over a contiguous block of two years. Accordingly, a listed entity identified as a LC, as on last day of FY "T-1", shall have to fulfil the requirement of incremental borrowing for FY "T", over FY "T" and "T+1". However, if at the end of two years i.e. 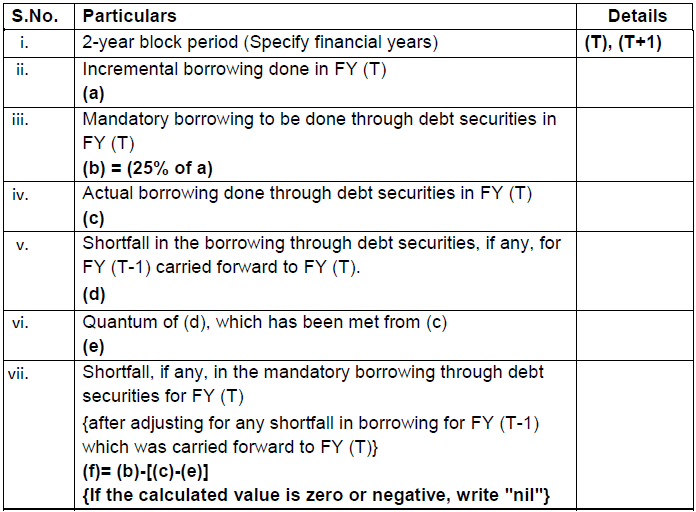 last day of FY "T+1", there is a shortfall in the requisite borrowing (i.e. 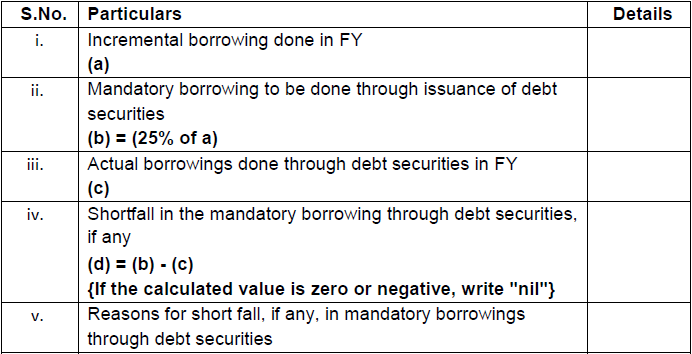 the actual borrowing through debt securities is less than 25% of the incremental borrowings for FY "T"), a monetary penalty/fine of 0.2% of the shortfall in the borrowed amount shall be levied and the same shall be paid to the Stock Exchange(s). 4.2. The disclosures made in terms of para 4.1 shall be certified both by the Company Secretary and the Chief Financial Officer, of the LC. 4.3. Further, the disclosures made in terms of para 4.1 shall also form part of audited annual financial results of the entity. 4.4. The details of the framework as mentioned under para 3 and disclosure requirements as mentioned under para 4.1, are illustrated in Annexure C.
5.1. The Stock Exchange(s) shall collate the information about the LC, disclosed on their platform, and shall submit the same to the Board within 14 days of the last date of submission of annual financial results. 5.2. In the event of a short fall in the requisite borrowing, the Stock Exchanges shall collect the fine as mentioned at para 3.2(ii). The fine so collected shall be remitted by the stock exchanges to SEBI IPEF fund within 10 days from the end of the month in which the fine was collected. 6. This Circular is issued in exercise of powers conferred under Section 11(1) of the Securities and Exchange Board of India Act, 1992 read with regulation 101(2) of SEBI (Listing Obligations and Disclosure Requirements) Regulations, 2015. 7. This Circular is available on SEBI website under the categories “Legal Framework” and under the drop down “Corp Debt Market”. We confirm that we are a Large Corporate as per the applicability criteria given under the SEBI circular SEBI/HO/DDHS/CIR/P/2018/144 dated November 26, 2018. 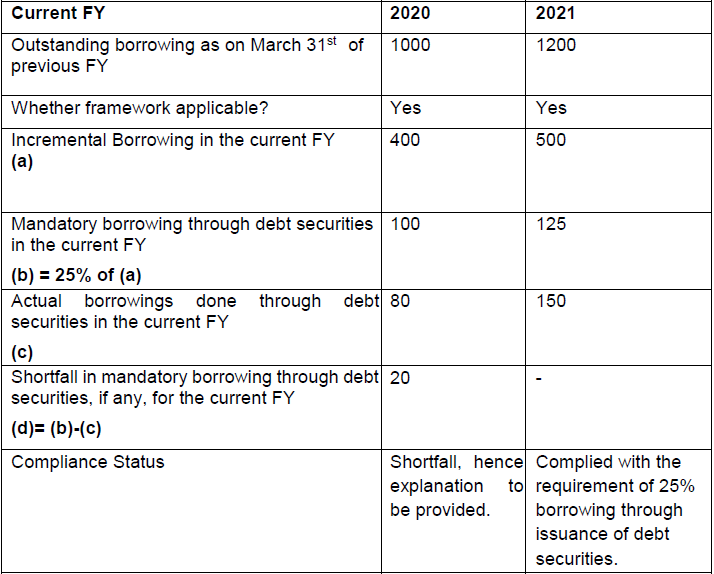 # - In terms para of 3.2(ii) of the circular, beginning F.Y 2022, in the event of shortfall in the mandatory borrowing through debt securities, a fine of 0.2% of the shortfall shall be levied by Stock Exchanges at the end of the two-year block period. Therefore, an entity identified as LC shall provide, in its initial disclosure for a financial year, the name of Stock Exchange to which it would pay the fine in case of shortfall in the mandatory borrowing through debt markets. $ - In cases, where an entity is not categorised as LC for FY (T), however was LC for FY (T-1), and there was a shortfall in the mandatory bond borrowing for FY (T-1), which was carried forward to FY (T), the disclosures as prescribed in this annexure shall be made by the entity for FY (T). #- (d) and (e) are same as mentioned at 4(v) and 4(vi) of this annexure. The illustration given below is only for the purpose of demonstration and shall not be construed in any other manner.